The funny thing about this book is that I’m pretty sure I’ve gained just about as much from it as my girls have. 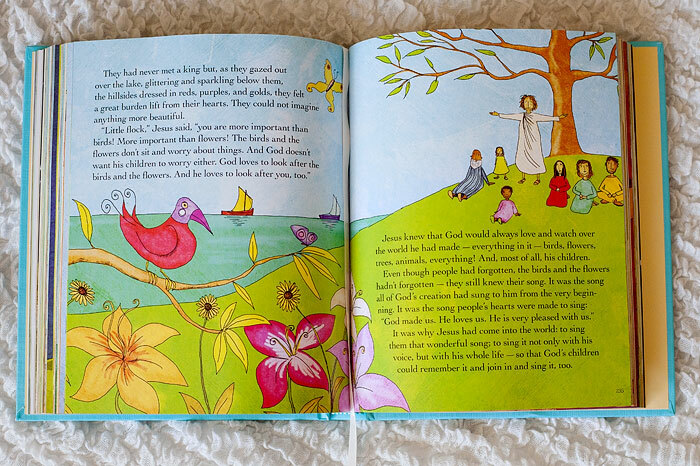 For example, I feel like I never really got the story of God asking Abraham to sacrifice his son until I was reading it to my girls from The Jesus Storybook Bible. Tears pricked my eyes as Sally framed the story within God’s plan for His people, and told us (in such beautiful language that it still moves me every time) about the way another son would someday actually sacrifice his life, the way Isaac had been willing to, and this time it would be God’s only son, the son He loved, just as Abraham had loved Isaac. 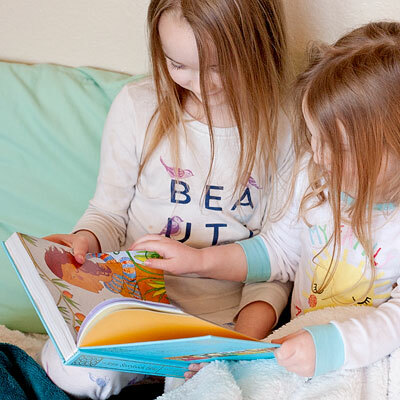 Of course, my girls love the book, too. There was a time when my four year old kept asking me to read from The Jesus Storybook Bible about Jesus dying on the cross. Over and over she would ask me. Read it again. Again. Finally I asked her why she wanted to hear such a sad story all the time and she looked up at me like I’d just called the sky green. “But it’s happy,” she said. It was my turn to look at her like she was crazy, but she quickly put me in my place. “It’s happy because I can go to Heaven now.” Sally had managed to reach my baby girl with the good news of the gospel. Jesus died for her, and because of His sacrifice she can go to heaven now. OK, so I feel like I should probably stop there, because really there’s nothing better than that. But, I wanted to share another quick story. Sally tells us about Naaman, who had leprosy, and his servant girl who told him Elisha could heal him. Now I’ve read through the Bible and had even heard a sermon about Naaman’s pride, but I’d never given a second thought to the servant girl before. When I read about her to my girls from The Jesus Storybook Bible, though, this little girl who was forgiving and kind made such an impact that she became the person one of my own sweet girls wanted to dress up as on dress like a Bible character day at church! 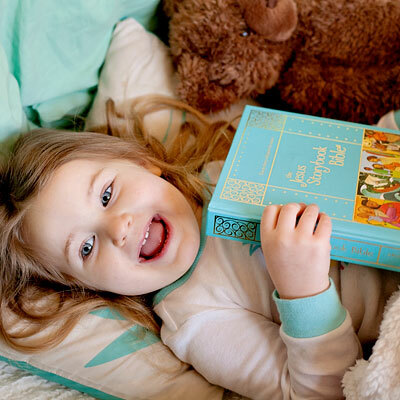 FYI there are a few other books from the creators of The Jesus Storybook Bible that I love too, including a sweet board book, Found, that I’ll tell you guys more about next week, and a book of devotional thoughts for kids called Thoughts To Make Your Heart Sing that I’ve read through several times with my girls and just adore!